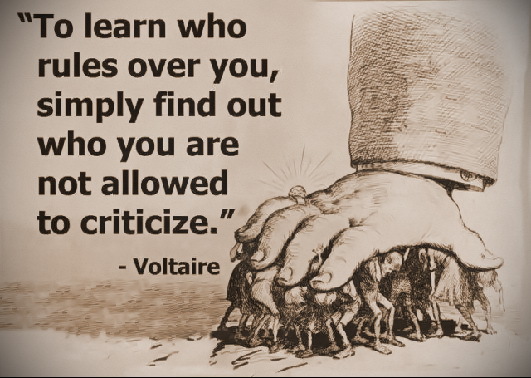 Image description: To learn who rules over you, simply find out who you are not allowed to criticise - Voltaire. A giant hand is pushing down and crushing a group of people, who are fighting back against it. Silencing. It's a good idea to think about why you're doing this. Keep this quote in mind. 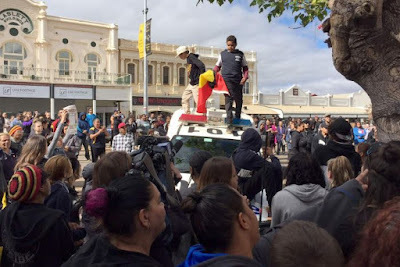 Silencing is not confined just to disabled people - Black and First Nations people and other marginalised groups also experience this treatment at the hands of members of dominant groups who want to silence people and quash dissent. We disabled people are tired of being spoken for when we have our own voice or means of expressing ourselves. Tired of having our struggles appropriated by non disabled people for cookies or kudos or pats on the head for their paternalistic altruism and 'good deeds'. Tired of non disabled people and people who are paid to represent us assuming that they know what is best for us without questioning or asking what we think. 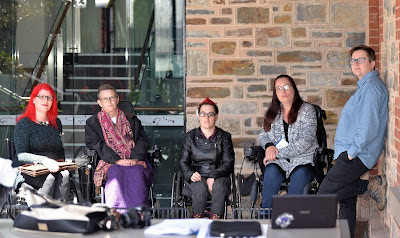 The history of disability rights is about silence and breaking silence for marginalised groups of disabled people. It compounds our marginalisation when tactics are used to shame or bully people into silence when they do speak out. If you censor disabled people, you are part of the problem. If you say you represent disabled people and you then suppress freedom of opinion and speech and power, you should pack your bags and go home. 'You are not an ally if you dismiss an Autistic person's experiences because of your perceptions of that person's abilities and challenges. If the above applies to what you've recently done or said, then yes - I am speaking about you. Shed non disabled tears if you like, but we will not be silenced. Your oppression is the problem, and so are you. Note on the concept of *voice* - intellectually disabled people, and folks who do not use spoken language, have a 'voice'. Amplifying that person's voice is just part of good support and it is important for people whose voices are rarely heard (and are often diminished by more vocal members of the community in the absence of good support and ableist ideas). The video below is by Suzy and Alison Proctor, who are siblings who speak together to educate others.